It’s time to start living YOUR ideal life! Each week, join Michelle Reeves, certified life coach and author of The Happiness Habits Transformation, as she shares inspiration and practical tips to claim success on your terms with clarity, confidence and the courage to unleash your passion on the world, plus regular interviews with women who are doing just that. If you’re ready to fast-track your ideal life and finally become the heroine in your life story, this is the podcast for you. Today I’m joined by former actress turned entrepreneur Charlie Day, co-founder of the franchise business Sounds Right Phonics Classes For Kids. Sounds Right Phonics has grown from just a few classes a week to now over 40 franchises in the UK and with plans to take the business overseas, Charlie is INCREDIBLY busy. But she and her sister were always keen to ensure that their work fit around their lives as parents, and this led to their ethos and passion for empowering other women and creating flexible working opportunities for Mums. In this candid interview, Charlie shares the tips she’s learned about being more productive including how to plan in self-care, goal-setting, time management and overcoming the fears we all have as women in business, even though she’s not naturally an organised person herself. She also talks about the importance of having a personal support community and how her training as an actress helps her deal with ‘performing’ as an entrepreneur. And full disclosure, I have to apologise for the few ‘bongs’ you’ll hear from Charlie’s notifications - she’s a busy lady for sure! Find out more about Sounds Right Phonics Classes for kids, and follow Charlie on Facebook and Instagram. 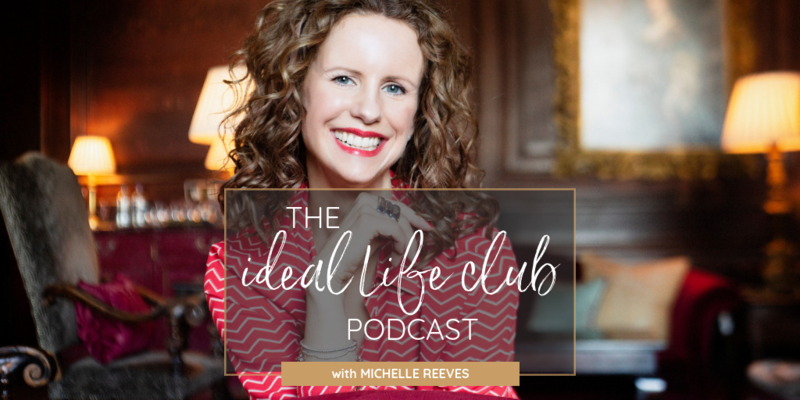 It’s been so much fun sharing my book The Happiness Habits Transformation at events in the UK this year and today you're getting to listen to the first two chapters here on this bonus episode of The Ideal Life Club Podcast. Also, as a special extra bonus for my listeners, I’m giving away 3 copies of The Happiness Habits Transformation. For your chance to win, share this podcast episode on social media with the hashtag #HAPPINESSHABITSTRANSFORMATIONBOOK and tag me. I’ll announce the winners on the podcast on April 25th. So tune in next week to see if you’re one of the winners. Today I’m joined by author, allergy educator and professional blogger, Emma Amoscato. Emma shares her journey from being a national features journalist who has written for The Times, The Guardian and The Independent newspapers here in the UK, to her son’s anaphylactic reaction in 2014 which led to her passion for empowering people with allergies and raising awareness to keep them safe and included. As you’ll hear in this interview, Emma is no stranger to challenge and adversity, having had to manage not only two children with severe allergies but also her husband’s kidney cancer diagnosis, but she has turned so much of what she and family have been through into a positive resource to help others. Emma talks openly about her own struggles with staying positive, the importance of having a personal self-care routine and how you can inform and empower yourself in the early days after receiving an allergy diagnosis AND in the following weeks and months. As we’re coming up to the end of the first quarter of the year, it's a great time to start planning ahead for quarter 2. So today I want to share with you my Simple 4-Step System for Planning Success. This episode is for you if you want to get crystal clear on what your big hairy goals are for the next quarter, getting into the detail of what you want to achieve AND how you’re going to get there. Plus I have a great freebie that you’re not going to want to miss out on! Today I’m joined by interior designer Sarah Davies, founder of Floella Interiors. Sarah has brought a wealth of Interior Design experience to the Cotswolds, following a career in London spanning twenty years. In this intimate and inspiring interview Sarah shares not only the challenges of leaving behind her position in a well respected London design practice and setting up her own business, but also her own personal story including how, a year into her business, a huge and sudden personal tragedy made her see her whole life differently and led her to make some crucial changes for her happiness and her family’s future. Sarah also shares the habits and practices that keep her positive, her top tips for overcoming the fears that so often hold us back, money saving tips for anyone who’s planning a room or home redesign and how to add colour and texture in the spaces we live and work in without breaking the bank. As always all the links Sarah shares are in the show notes which you can find at michellereevescoaching.com/listen. Sarah is one of the most courageous women I’ve had the pleasure to interview and I feel privileged to share her story in this episode. I hope you enjoy it too. Do you know your worth? Do you see your sparkly value? Do you understand your incredible importance in the world? If these questions make you feel a bit uncomfortable, this episode is for you as I share 10 ways to help boost and maintain your self-worth. One of the greatest gifts we can give ourselves is the gift of believing in our inherent worth as amazing women. Without a clear understanding of our self-worth, it’s SO much harder to move forward and touch other people’s lives in a beneficial way, to be the role model that we want to be, and we can end up settling for less than we truly deserve in life. Allowing-in toxic relationships, tolerating situations that make us unhappy, letting other people’s expectations rule our decisions… none of these things serve us. But we can let ourselves believe that somehow we’ve caused those things to happen so we have to own them. Our identity and our value can be tied to what we believe others think of us, to what we most recently achieved (or didn’t achieve), to past situations or the unrealistic expectations we place on ourselves. But all of that masks an incredible TRUTH. The truth that we are worthy just as we are right now, with all our perfect imperfections, regardless of our baggage, our past and our future. In this episode I’m joined by marketing expert Janine Coombes. Janine helps small businesses create simple marketing that works, using the processes she honed in her 15 years working with big brands like EE, Orange and Europcar so you get more results from the marketing efforts you put in. In this interview, you’ll hear how difficult Janine found the transition from corporate life to running her own business, the mindset challenges she had to overcome, including battling the feeling that to be a good mum she had to replicate her own Mother’s experiences, and how she still has a wobble whenever a new opportunity arrives in her business. We chat about the importance of being authentic in our businesses, Janine shares her tips for focusing on the fundamentals of business strategy and the aha moment that changed her life and led her to not only become more intentional in her life and work but to fronting her own band! This was such a fun interview to record with Janine, grab a pen and paper to write down all the great nuggets she shares, and I hope you enjoy listening to it. Do you find yourself struggling to make decisions? Do you worry that you’ll make the wrong choice or what people will think about your choice? And why do we find it so hard to make decisions in some areas of our lives, but not in others? If you’re anything like me, there’s been times in your life when you’ve really struggled to make a decision about something. Perhaps it was whether to apply for a new job or switch careers, what your next move should be in your business or even what to wear for a special occasion. Now, you might think you struggled with those decisions because you’re just an indecisive person, right? That it’s part of your make-up. But decision-making is actually a skill and one that everyone can learn to be better at. Listen in to this episode for my 8 simple steps for problem-solving. In this episode, I’m joined by Dr Rosie Knowles. Rosie is a practising GP, author, speaker, Mum of 2 and founder of the Sheffield Sling Surgery and Library. Her business grew from her passion for educating parents about the benefits of baby-wearing and now she lectures on the topic as well as maintaining her doctor’s practice. Rosie is also deaf and in this candid interview, she talks about both the physical challenges she faced, setting up her fledgeling business and the difficulties she had combining all of her various roles in life. Rosie shares her top tips for getting going when things get tough, how the right mindset helped her overcoming those challenges, the tell-tale signs that you’ve got your work/life balance wrong and the importance of not trying to do everything yourself. Happy Valentine's Day! Now I know traditionally Valentine’s Day is all about celebrating that significant other in your life, but in this episode I want to shake that up a bit and share with you my top 10 strategies for giving YOURSELF a bit of love today and every day. Often as women, mothers, wives, sisters, daughters and business owners, so much of our daily routines revolve around everyone but ourselves. We pour our love and attention abundantly over others but leave only a few drops for ourselves. In our always-on world, we’ve elevated busy-ness to new heights, judge success in terms of status symbols and use social media to compare ourselves with hundreds of other women we barely know. We run ourselves into the ground, feeling guilty for taking time out for our own dreams and passions and remain last on our to-do list. If we don’t replenish our well of self-love regularly we can become exhausted, overwhelmed, resentful even, and run to the instant highs of Netflix, sugar-fixes and flexing our credit-card muscles. I believe that self-love isn’t just a nice-to-have, it’s a necessity for us all. Self-love isn’t selfish… it’s sustenance.